A couple weeks ago we had a wonderful cranberry peach cobbler at a local restaurant. I noticed that it also had raspberries and seemed to have more raspberries than cranberries. The peaches and raspberries were a pretty good combination. Last week I was checking out the berries at my local supermarket when I noticed some odd looking raspberries. The package said they were golden raspberries, which I don’t really recall seeing before. I smelled the raspberries and they smelled great, so I bought a few packages thinking I would make a sorbet. The peaches were just around the corner and the best looking ones they had happened to be white peaches. An idea was born and I went home to tinker with a recipe. This recipe is a hybrid of the raspberry sorbet and peach sorbet recipes on the site. I decided to go 50/50 on the peaches and raspberries, not sure I wanted either to dominate. Sorbets are a treat to make since few require any cooking. Unlike the peach sorbet recipe, which doesn’t even require straining, the presence of raspberries compels me to pull out my chinois. 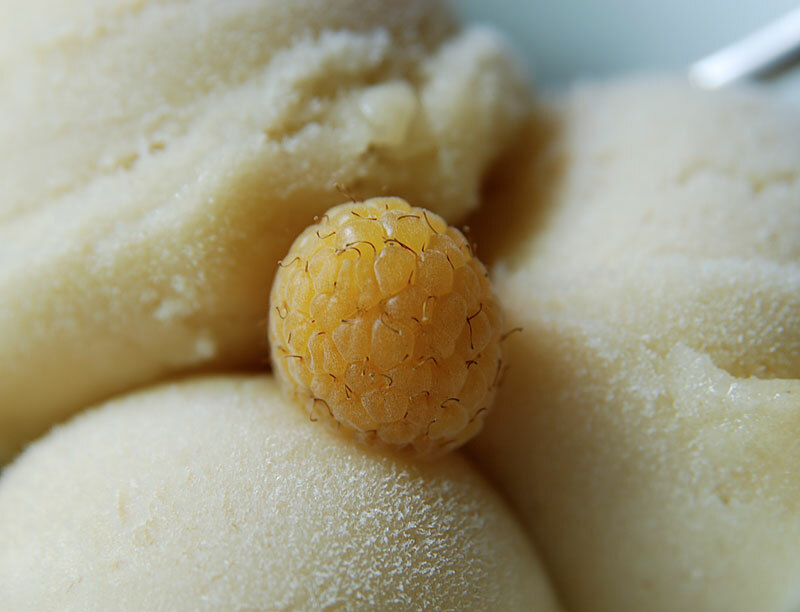 I don’t mind berry seed in jams or preserves, but I like my sorbets to be smooth. I rounded out the recipe with the juice of one orange and some grand marnier. 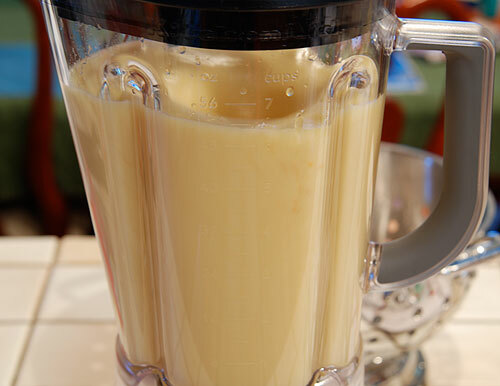 Once I placed all the ingredients in the blender and watched the fruit purée, I thought the mixture looked a little like mashed bananas or applesauce—yet the smell was unmistakably peach and raspberry. I knew then that this was going to be a really interesting recipe since it just didn’t give you any visual cues about the flavor. The mellowness of the peaches is perfectly balanced with the zing of the raspberries while the subtle orange and grand marnier flavors help give a little more depth. Without any vivid color that ordinarily accompanies most sorbets, I find that I have to think about each individual fruit in order to isolate them on the palate. Without the color red, you just don’t expect it to taste like raspberries. I’m almost tempted to put just a little banana in there, but then that really would be predictable, and that’s what is so fun about this sorbet: you just don’t know what you are getting. 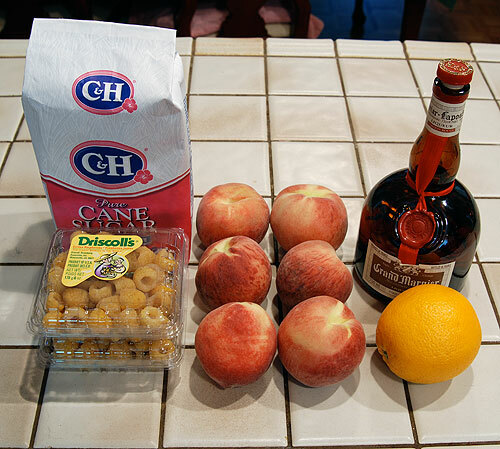 Ingredients for making Golden Raspberry and White Peach Sorbet. 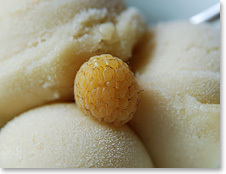 Gently rinse and towel dry 2 cups of golden raspberries. Juice one orange into blender with raspberries. Peel and pit enough peaches to yield 2 cups of peaches. Add peaches and 1 1/4 cups of sugar to blender. Purée peaches, sugar, juice and raspberries until smooth. Pass purée through a sieve or chinois to remove raspberry seeds. 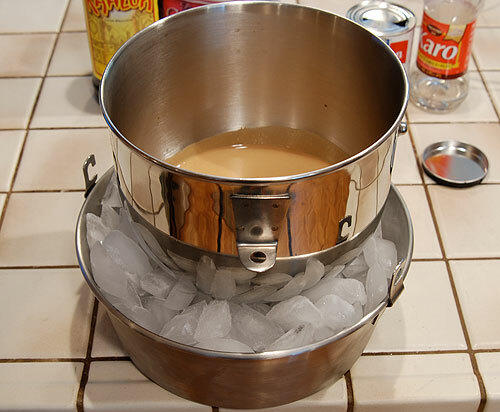 Add 1/4 cup of Grand Marnier to purée and chill in an ice bath until temperature is less than 45° F.
Pour mixture into ice cream maker and chill according to your maker’s instructions. 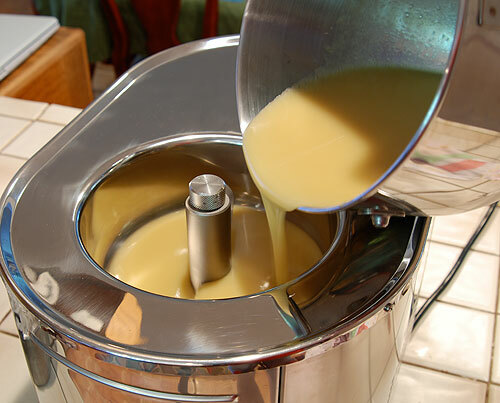 Let churn until thick before transferring to a dedicated, odor-free container to ripen in the freezer for several hours. 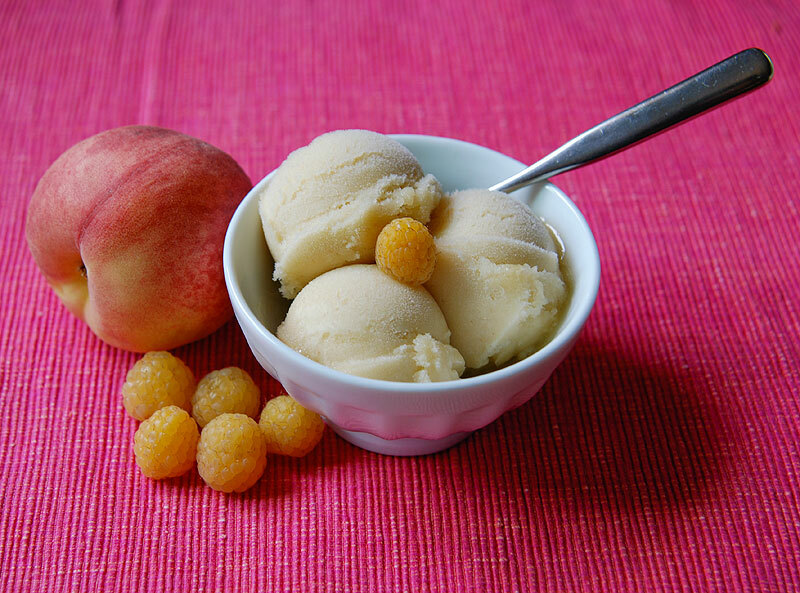 The recipe pictured above, with detailed instructions and exhaustive photo gallery can be found on the Golden Raspberry and White Peach Sorbet recipe page. I have to admit that when I think of my favorite ice cream flavors, strawberry is not one of the flavors that come to mind. 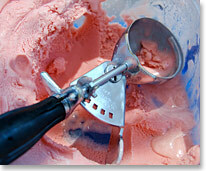 I tend to associate strawberry ice cream with childhood and Neapolitan ice cream. Most strawberry ice creams you come across are made with frozen strawberries and—for me—are kind of boring. I first made this recipe almost two years ago after smelling wonderfully ripe strawberries at the store. 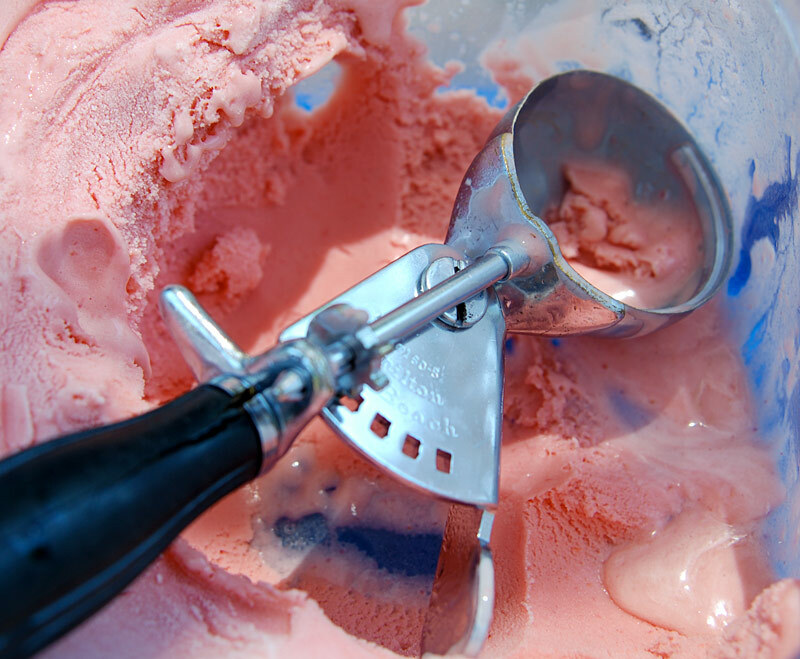 The recipe I ended up with was a blend of several recipes and was intended to yield a rich and creamy ice cream that really let the flavor of the fresh strawberries shine. The resulting ice cream was very delicious, but perhaps a little too rich. As good as it was, tasters remembered the flavor more because it was unique and less so because of the flavor. 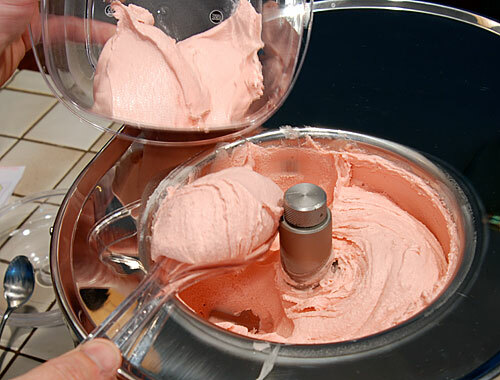 When I decided to make strawberry ice cream again last week, I decided the recipe needed a little overhaul. 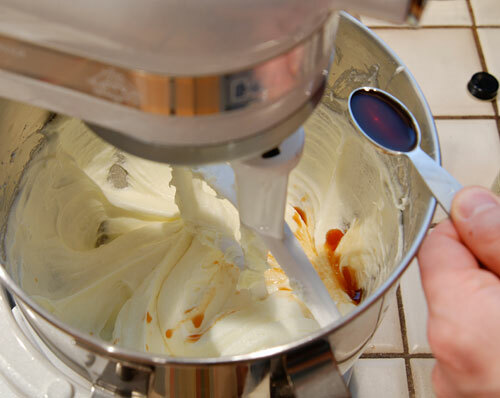 I’ve made quite a few ice creams since I first made this recipe, so I have a better idea on how to tune the recipe. I decided to both decrease the egg yolks called for and adjust the ratio of whole milk to cream making them equal. The resulting ice cream was simply amazing. Part of what makes this recipe special is the presence of orange and lemon juices. The brightness added by the juice from one lemon really goes a long way towards keeping the freshness of the strawberries from being muted by the custard and cream. 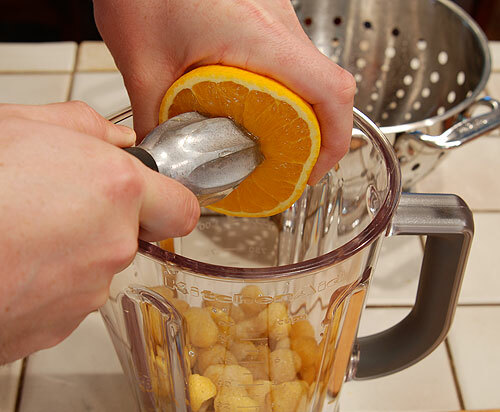 The orange juice helps broaden the flavor and give it a little more depth. This recipe omits vanilla extract, which is common in many strawberry ice cream recipes. As much as I love vanilla, it too conspires to mask the freshness of the strawberries, yielding instead a strawberry flavored vanilla ice cream. Because this ice cream involves cooking a custard base, juicing two citrus and blending the strawberries, it is a little more work than your typical fruit flavored ice cream or sorbet. 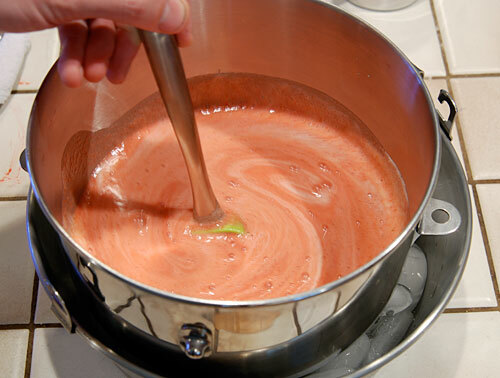 Of course, I also opt to pass the strawberry puree through a chinois (when don’t I?) as this removes all the seeds to produce a silky smooth ice cream. If you like bits of strawberries in your ice cream, I’d recommend adding them at serving time since frozen strawberries can be icy. 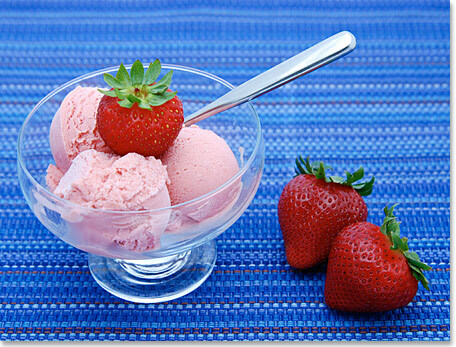 The fresh strawberries coupled with this ice cream will really bring the fresh strawberry flavor home. 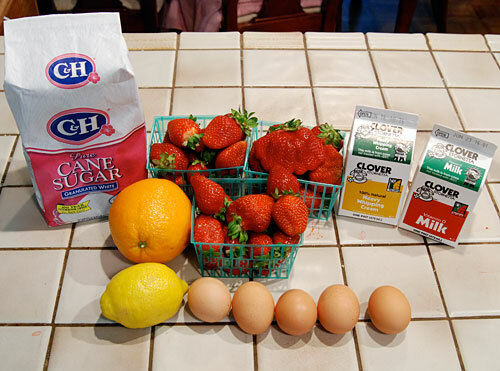 Ingredients for making Strawberry Ice Cream. While heating 1 1/4 cups of whole milk over medium heat, beat together 5 egg yolks and 1 1/2 cups of sugar until light and fluffy. 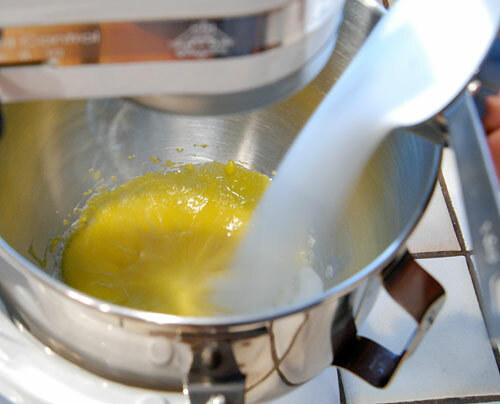 With mixer on low, slowly pour the simmering milk into the beaten egg yolks and sugar. 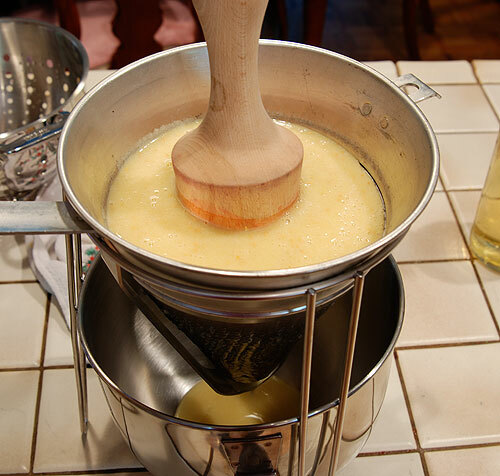 Return custard base to saucepan and heat over medium heat, stirring constantly until temperature reaches about 170° F. Pour through a chinois into ice bath and cool. 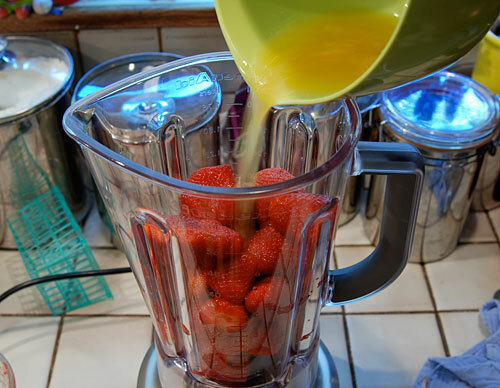 Once the custard base reaches room temperature, rinse and hull 4 heaping cups of strawberries and place in blender with juice of 1 lemon and 1 orange. Purée until smooth and pour through chinois to remove seeds. 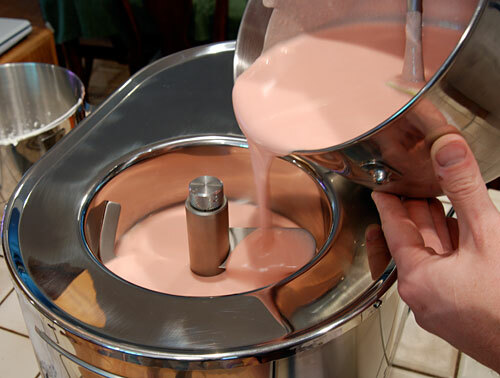 Mix strawberry purée into custard base and continue chilling until mixture reaches 45° F.
Beat 1 1/4 cups of chilled heavy whipping cream until soft peaks form. 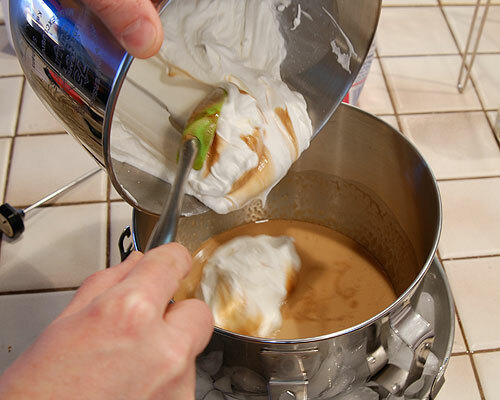 Gently fold the whipped cream into the chilled ice cream base. The recipe pictured above, with detailed instructions and exhaustive photo gallery can be found on the Strawberry Ice Cream recipe page. Last week my son and I had our violin/viola recitals and our teacher asked me to bring some cookies. I decided to make some oatmeal cookies since it has been a while since I made them. 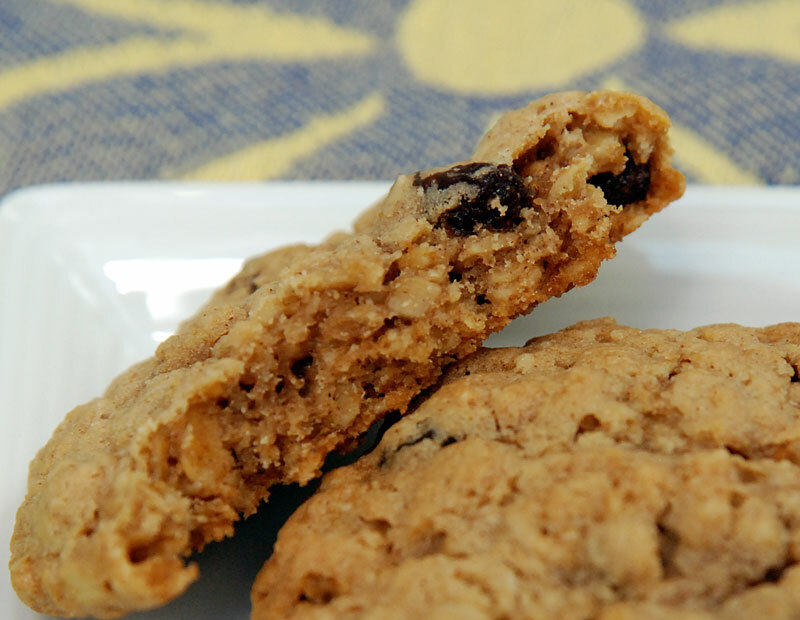 I like this recipe because the cookies are a little chewy, and I remember most oatmeal cookies I had as a kid being kind of dry and hard. Oatmeal cookies always seem like they are supposed to be better for your health, but I don’t think I completely buy into that theory. It’s pretty much the same amount of butter and sugar as most any other cookie. Maybe the added raisins or optional craisins (dried cranberries) are supposed to convert the skeptics. 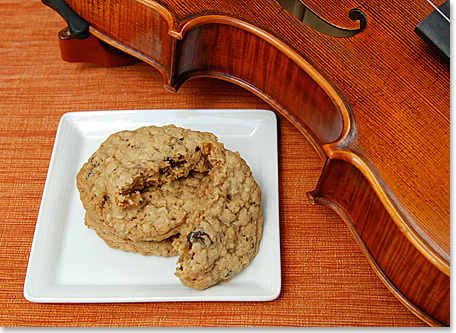 Once nice thing about this recipe is that it is actually difficult to over bake the cookies. The first batch I made was a little thinner and chewier than I liked (though some prefer them that way) so I upped the flour by 1/4 cup and then they started to behave the way I wanted. If only I had a second chance at the recital. 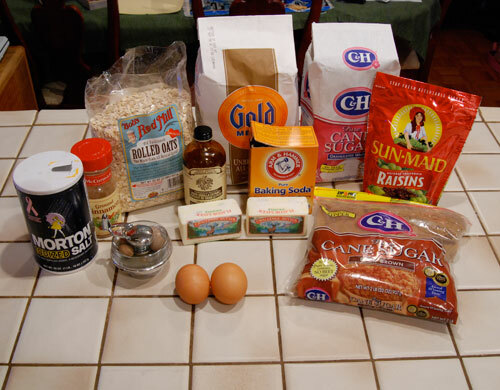 Ingredients for making Oatmeal Cookies. 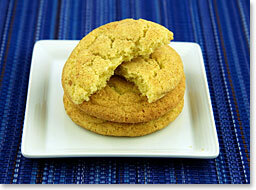 Beat together 1 cup of butter, 1 cup of brown sugar and 2 eggs until light and fluffy. 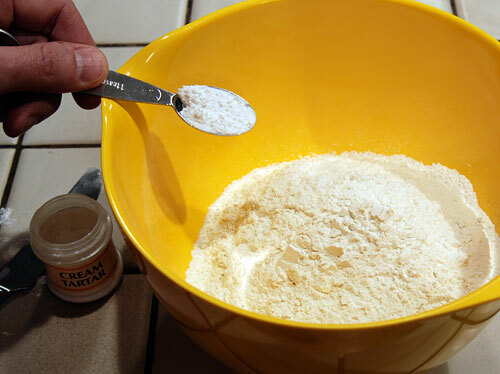 Add 1 teaspoon of vanilla and 1/2 cup of sugar, scraping down sides of bowl to ensure even mixing. 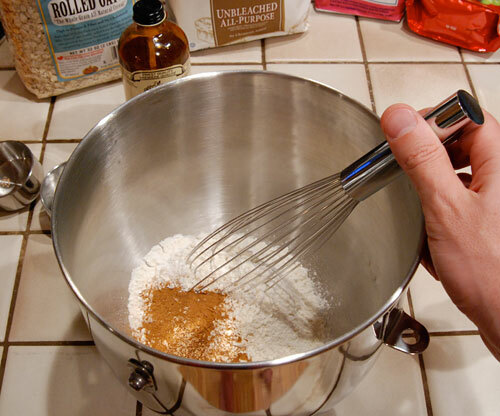 Mix dry ingredients in a separate bowl. 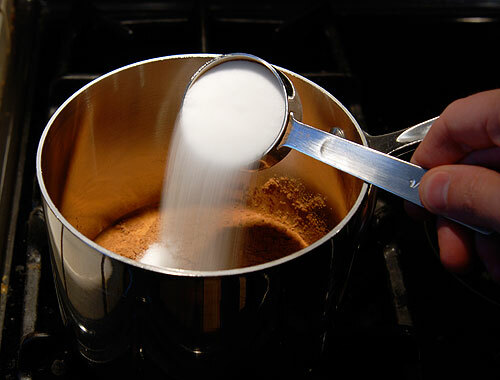 Combine 1 3/4 cups of flour, 1 teaspoon each of baking soda and cinnamon, 1/2 teaspoon salt and 1/4 teaspoon of nutmeg and mix gently with a whisk until blended. 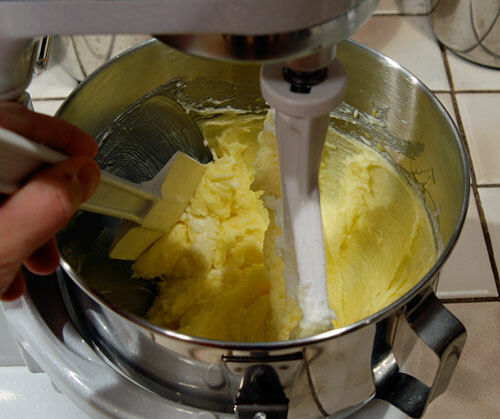 Slowly add dry ingredients to creamed butter and sugar mixture, scraping down sides of bowl occasionally. 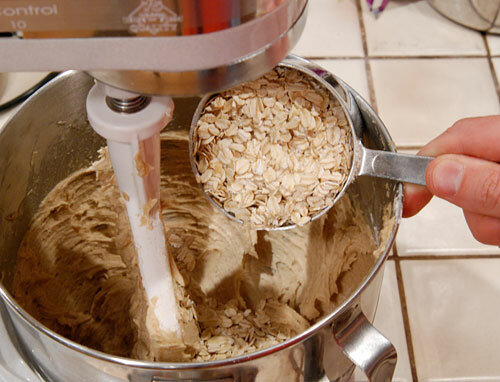 Add 3 cups of rolled oats and mix until incorporated. 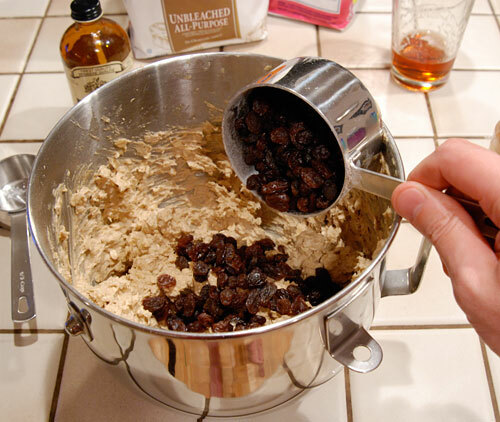 Add 1 cup of raisins and stir in by hand to minimize tearing the raisins. Roll into 1 1/4 inch balls and place on ungreased cookie sheet. 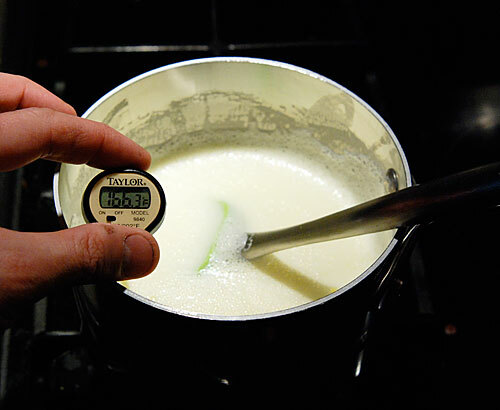 Bake for 11 – 13 minutes in 350° F oven. Remove and let cool on sheets for 1 – 2 minutes before transferring to cooling racks. 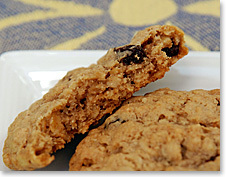 The recipe pictured above, with detailed instructions and exhaustive photo gallery can be found on the Oatmeal Cookies recipe page. 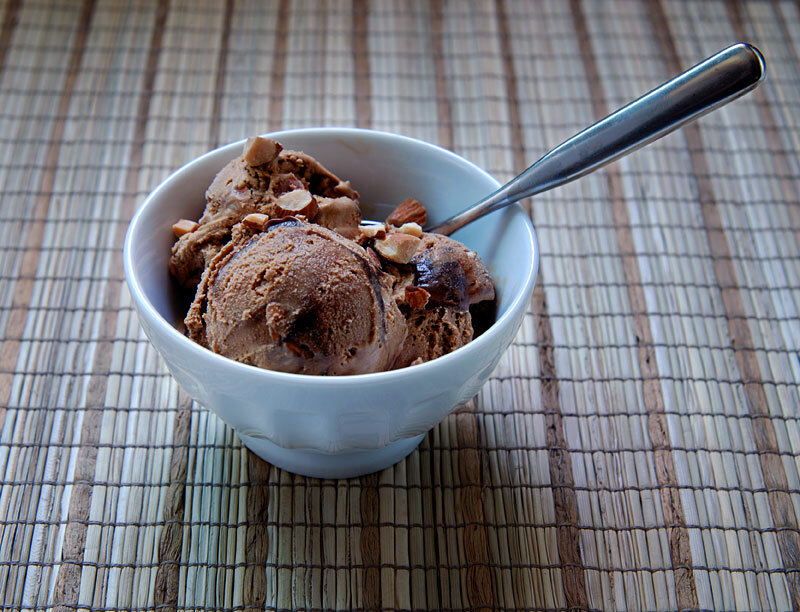 When I was in high school, one of my favorite ice cream flavors was mocha almond fudge because it was like a portable coffee and chocolate sundae, with the fudge and nuts neatly packed inside. For some reason I have never really considered making it, perhaps because I was unsure of how to marble the fudge with the ice cream. Last June, Kieran from Ice Cream Ireland put out a call for readers to try out some of his recipes in anticipation of his new book (still not readily available in the US, but you can order it from the publisher if you are eager like me—will let you know when it arrives) and I decided to try making his Kahlúa Espresso Ice Cream (my post about it here). The coffee flavor of this ice cream was amazing, and I knew right away I had to adapt it to make some mocha almond fudge ice cream. Nearly a year later, here it is. I knew I already had the perfect fudge sauce recipe for this ice cream, but I needed to reduce the hot fudge sauce recipe by about half to provide just the right amount for this ice cream. Of course, I ended making a regular batch of hot fudge sauce later that night since my daughter loves it and was disappointed to learn there wasn’t any leftover after the smaller batch I made for this ice cream. While I was waiting for the ice cream to freeze in my ice cream maker, I thought about how hard the fudge sauce might get when once it was frozen. 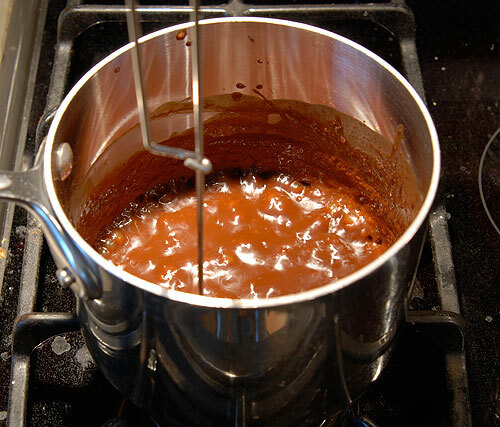 The original hot fudge sauce recipe is intended to be heated and poured over the ice cream, resulting in a thick, warm sauce. I decided to get a preview of what I might end up with and placed some sauce on a spoon and left it in the freezer. After 10 minutes, I knew that it would be too hard once frozen with the ice cream. I salvaged the first batch of fudge sauce by adding a little more evaporated milk and stirring it in to the still warm sauce, resulting in just the right texture once frozen. 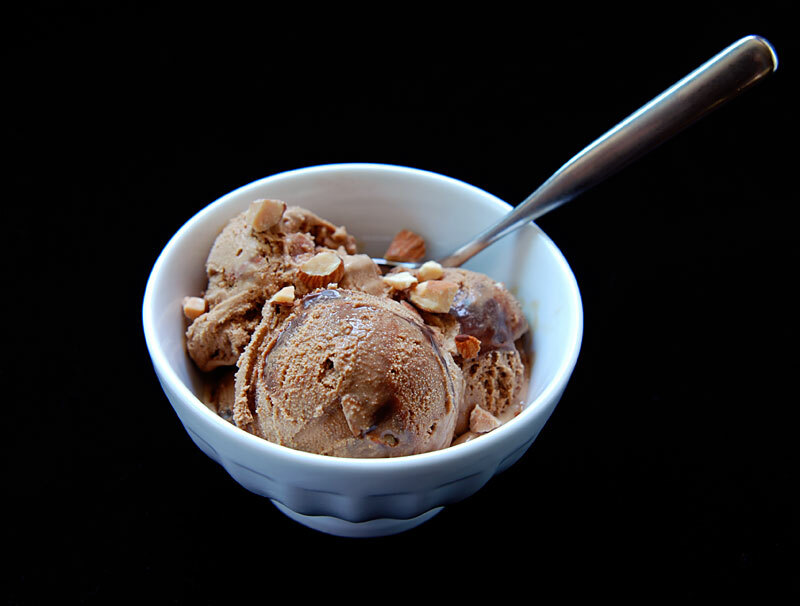 The first time I made this I added the almonds and the fudge to the ice cream maker immediately before shutting it off, but the fudge ended up getting too blended. 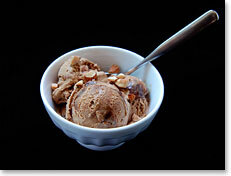 In addition, the almonds generally sank to the bottom of the ice cream as it ripened in the freezer. To remedy both problems, I decided to let the ice cream firm up in the freezer for an hour before layering in the almonds and room temperature fudge sauce. A few plunges of the spatula into the ice cream broke up the layers and gave the fudge marbling a more random appearance, while still preserving the yummy chocolate veins. There are a lot of steps to this recipe, but you can take advantage of the chill time of the ice cream base, the initial freezing of the ice cream, or the hour of firming up in the freezer before layering the almonds and fudge sauce. 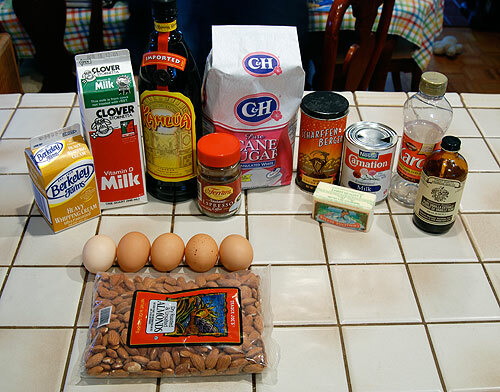 I’ve arranged the steps in the recipe to take the least amount of time possible, but you could toast the almonds or make the fudge sauce ahead of time. 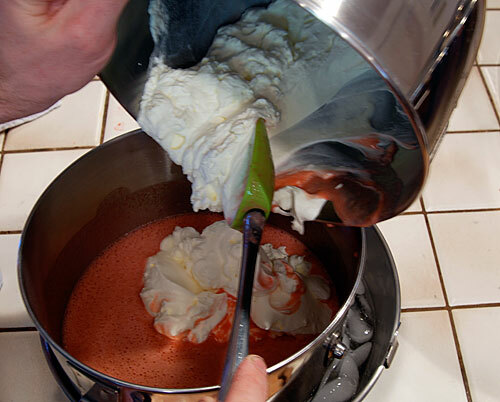 If the sauce is chilled, you will want to get it to room temperature so that it will be easier to distribute in the ice cream layers. 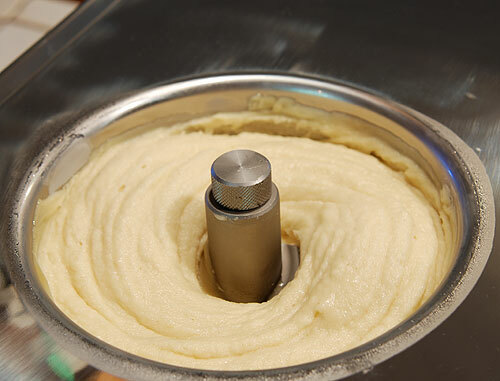 Once the ice cream is finally ready to eat, you will understand that your efforts were worth it and why I didn’t think twice about making this a second time to refine the steps for this recipe. 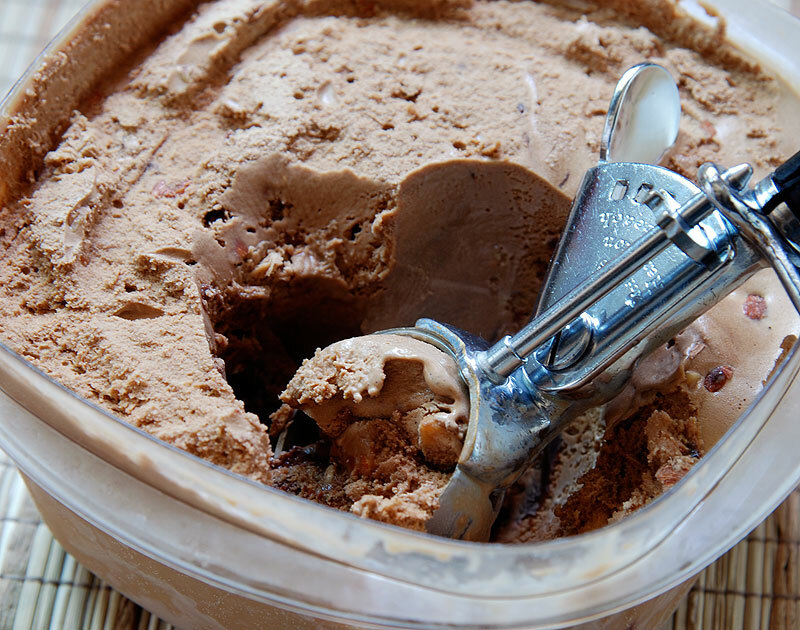 The Kahlúa, although not necessary if you have issues with alcohol, adds a wonderful depth to the coffee flavor in this ice cream. You will be thinking about your next batch as you finish the first. 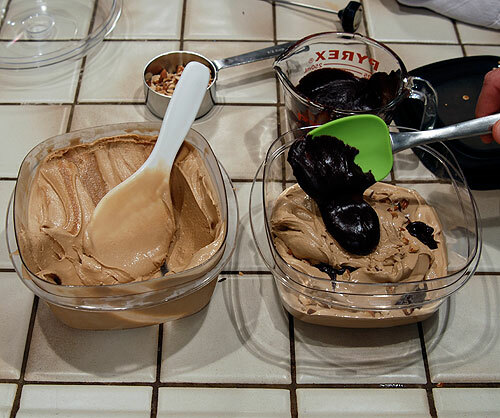 Ingredients for making Mocha Almond Fudge Ice Cream. 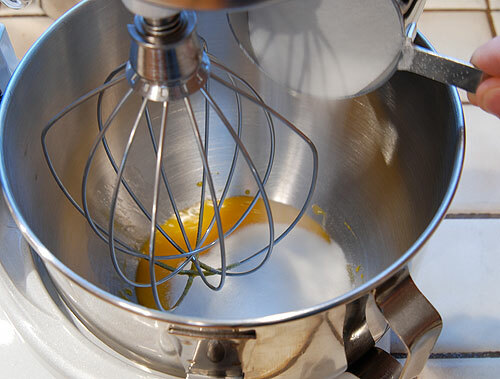 Beat 5 egg yolks and 1 cup of sugar until light and fluffy. 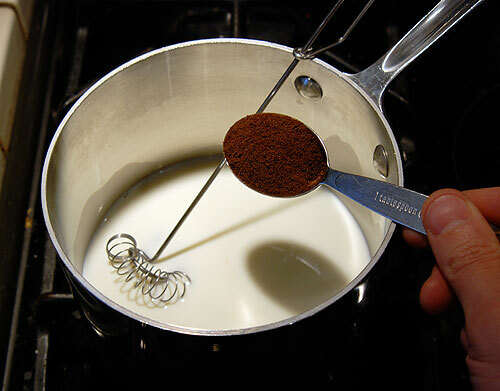 Heat 1 1/4 cups of whole milk, 2 tablespoons of cocoa powder and 3 tablespoons of espresso powder until simmering. 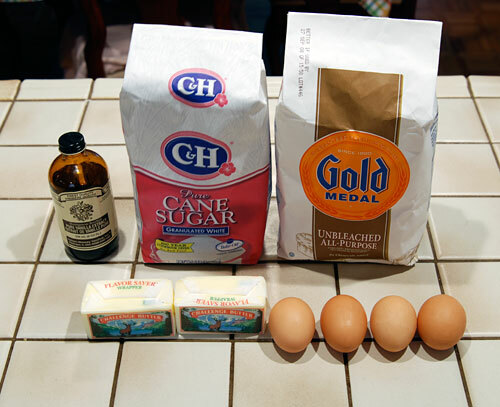 Slowly add this to egg and sugar mixture while mixing on medium speed. 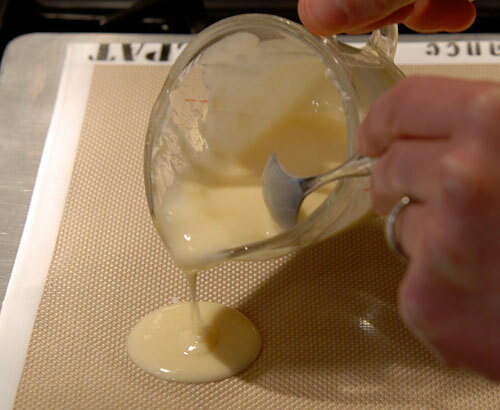 Return custard mixture to saucepan and cook over medium heat, stirring frequently, until it reaches about 165° F.
Pour custard base through a sieve or chinois to remove any egg bits and chill in ice bath. While custard base is cooling, prepare fudge sauce. 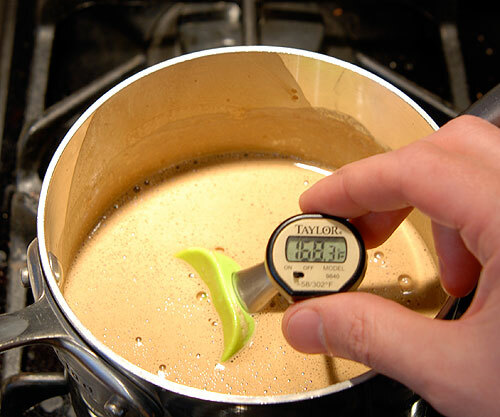 Cook 1/4 cup + 2 Tbsp sugar, 1/4 cup cocoa, 1/2 cup evaporated milk, and 3 tablespoons corn syrup over medium heat. 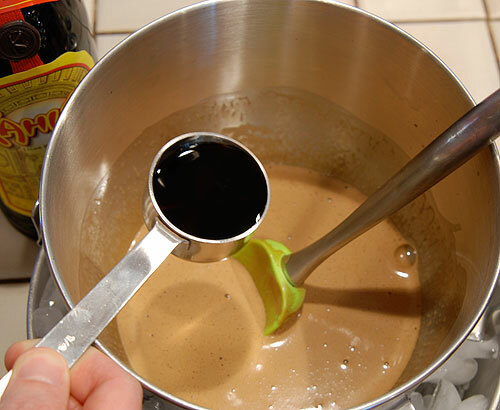 Boil fudge sauce for 5 minutes and then remove from heat. 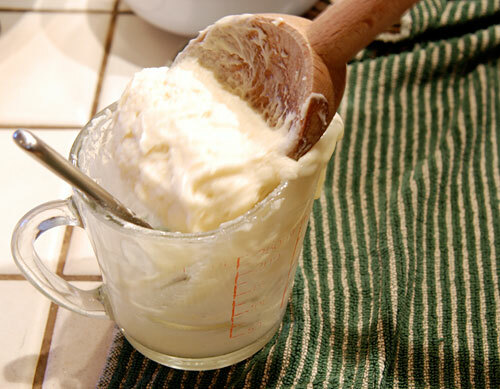 Stir in 2 tablespoons + 2 teaspoons butter and 1/2 teaspoon vanilla and let cool to room temperature. 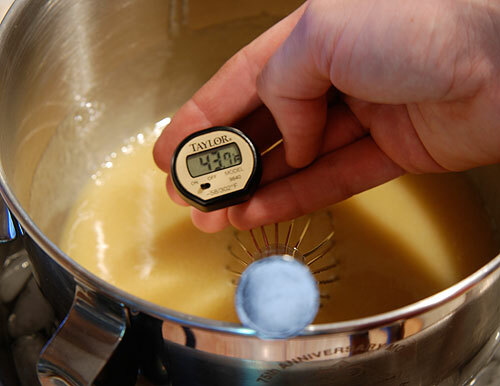 Once custard base has chilled to less than 45° F, add 1/4 cup of Kahlúa and stir to blend. 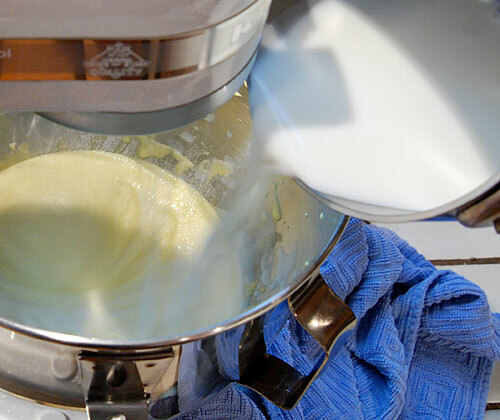 Beat 1 1/4 cups of whipping cream until soft peaks form and gently fold this into chilled custard base. 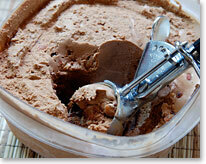 Pour ice cream base into ice cream maker and freeze according to your maker’s instructions. 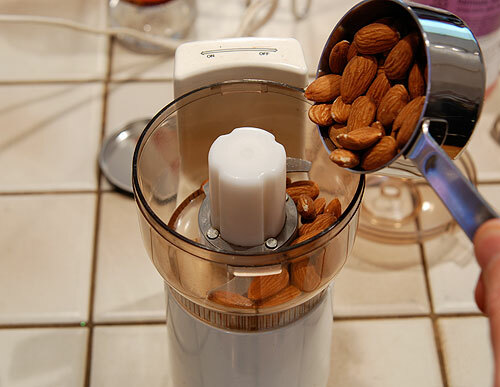 While ice cream is churning, chop about 2/3 cup of almonds. 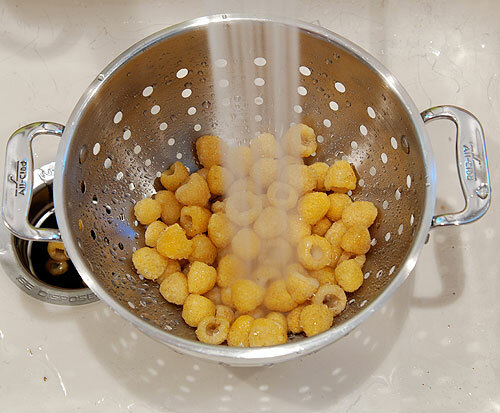 Use a colander to help remove the smaller, dustier particles. 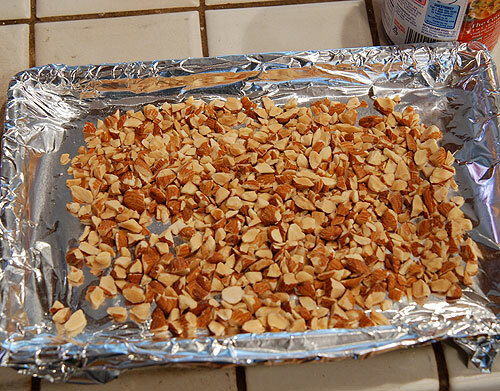 Arrange chopped almonds in flat layer and toast in 350° F oven for 5 minutes (toaster oven is fine). Let cool to room temperature. 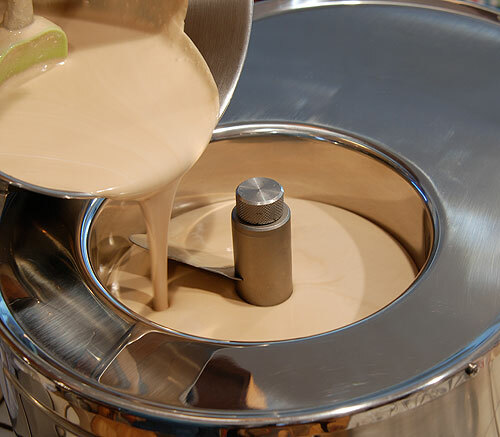 Once ice cream has finished churning, transfer to a dedicated, odor-free container and let ripen in freezer for one hour. 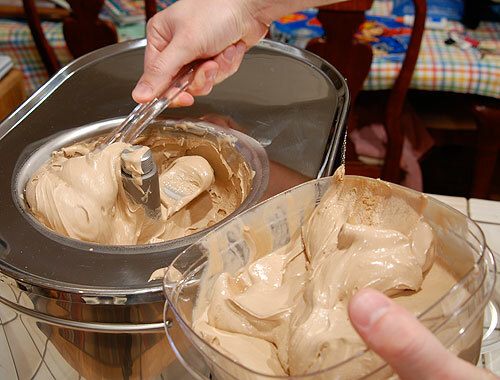 Remove ice cream from freezer and begin layering another container with a layer of ice cream and then a scoop of room temperature fudge sauce. 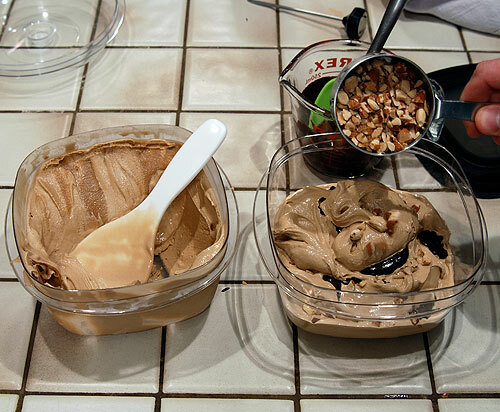 Add a layer of the almonds and repeat the layering of ice cream, fudge sauce and almonds. Plunge a spoon into the layers several times and then let firm in the freezer for several hours or overnight. The recipe pictured above, with detailed instructions and exhaustive photo gallery can be found on the Mocha Almond Fudge Ice Cream recipe page. Snickerdoodles. I can’t think of too many other cookie recipes with a silly name that gives you no clues about what is in it, what it looks like, who created it or perhaps who frequently consumes them. What is certain, however, is that there are as many versions of this recipe as there are theories about their origin. 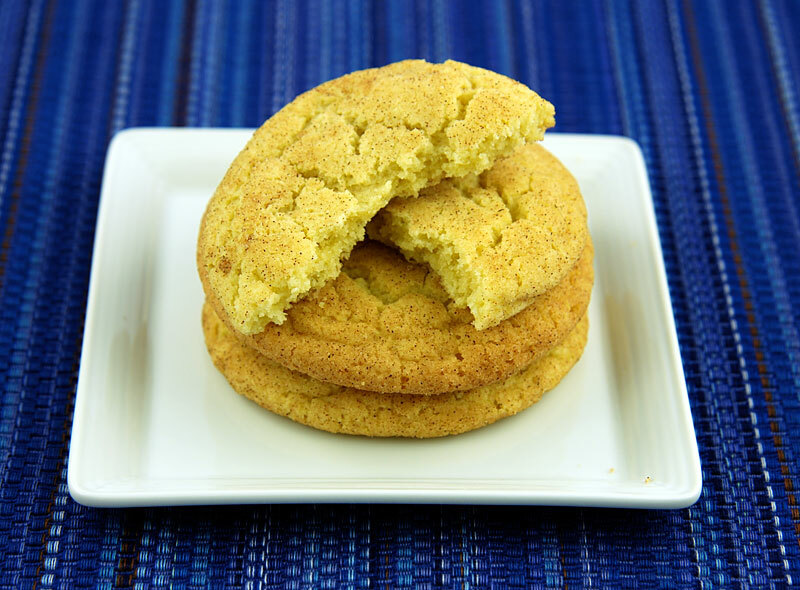 Snickerdoodles are one of the early recipes I remember baking with my mom 30 years ago. Essentially a sugar cookie with a little cinnamon on the outside, what isn’t there for a kid to love? As a recipe, I think snickerdoodles are pretty forgiving and hard to mess up. Perhaps that explains the many variations of the recipe. It would be interesting to take a half dozen variations head to head to see what the differences are. 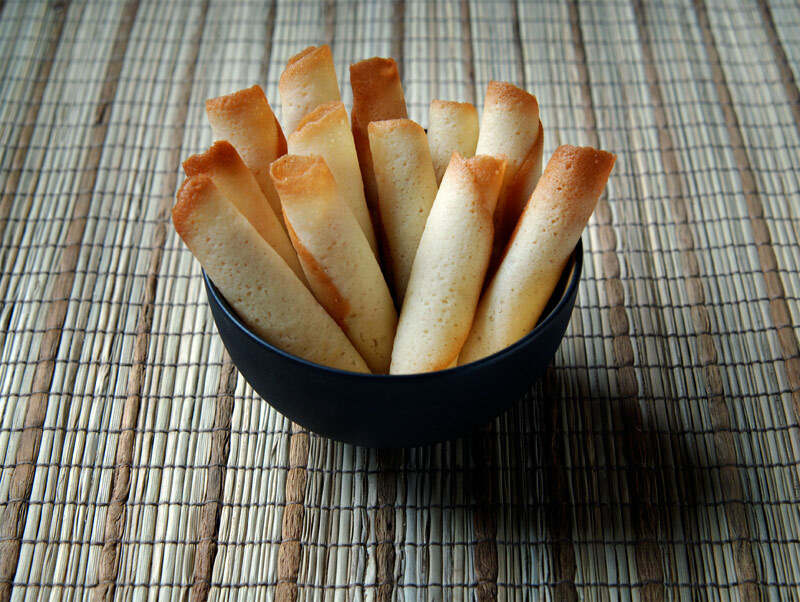 Depending on your mood, you can bake these crunchy or soft and the two textures result in very different cookies, equally delicious (though I like them a little soft in the middle). 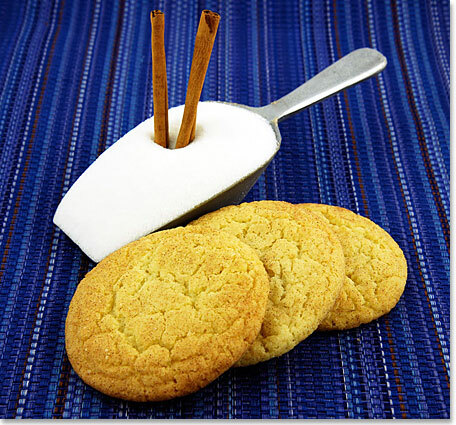 There are a lot of people that debate the cream of tartar in snickerdoodles. The accepted explanation indicates that the cream of tartar acts as an acid to assist the baking soda. I can see how this would makes sense given my college background in science, but the ingredients in this recipe aren’t all that different from the popular chocolate chip cookie, so I don’t know if the cream of tartar does all that much for the baking soda and probably alters the taste just enough to make it worthwhile to leave it in. Maybe someday I’ll experiment with it, but after 30 years with this snickerdoodles recipe, I don’t have any complaints. Cream 1 cup butter, 2 eggs and 1 1/3 cups of sugar until light and fluffy. 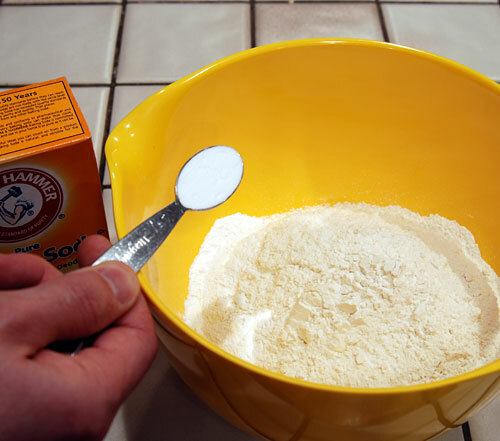 Add 1 teaspoon baking soda to 3 cups of flour. 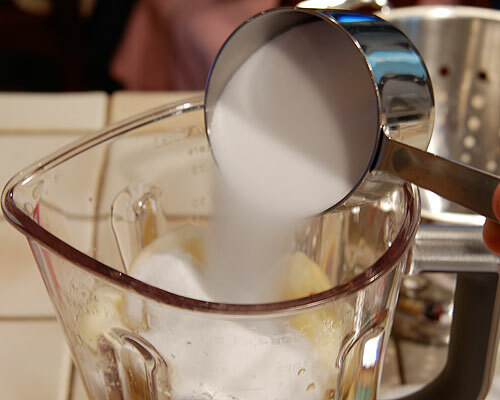 Add 1 1/2 teaspoons of cream of tartar to dry ingredients. 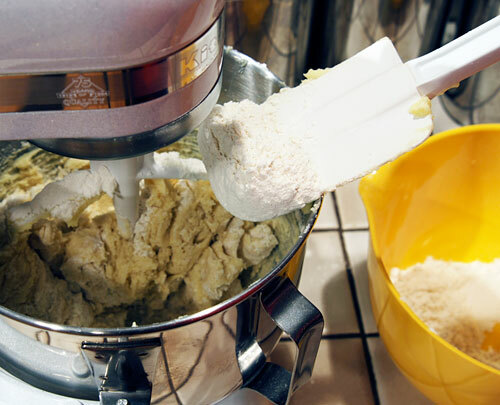 Add a pinch of salt and mix dry ingredients until thoroughly blended. 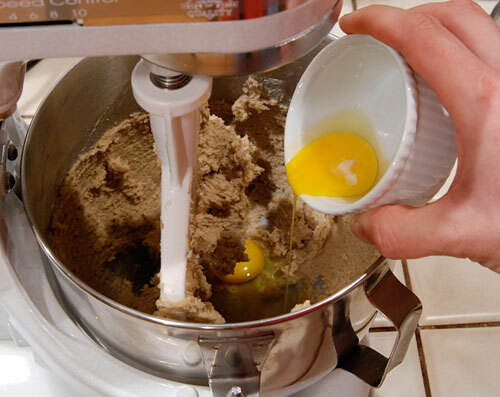 Slowly add dry ingredients to butter, egg and sugar mixture, scraping sides of bowl occasionally to ensure even mixing. 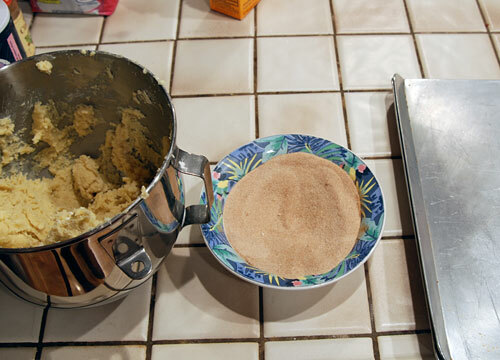 Roll dough into 1 inch balls and then roll in cinnamon sugar mixture made of 1 tablespoon cinnamon and 3/4 cups of sugar. 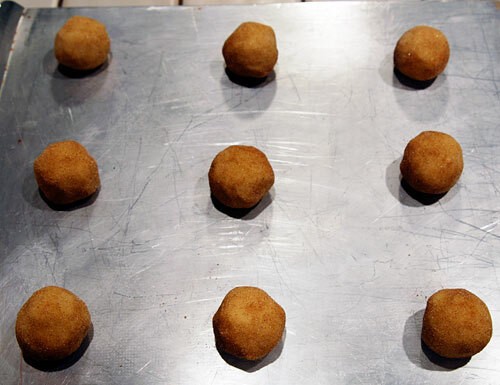 Arrange dough balls evenly on ungreased cookie sheet. 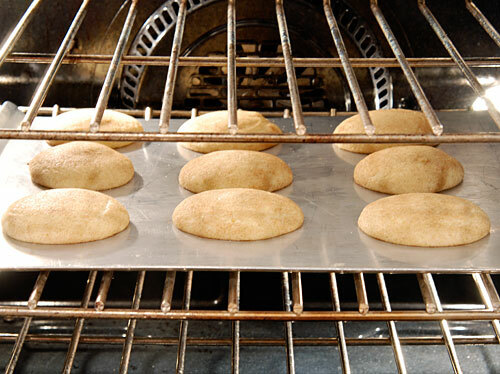 Bake for 10 – 12 minutes in 375° F oven until lightly browned. Let cool for 1 minute on cookie sheet before cooling on racks. The recipe pictured above, with detailed instructions and complete photo gallery can be found on the Snickerdoodles Cookies recipe page. 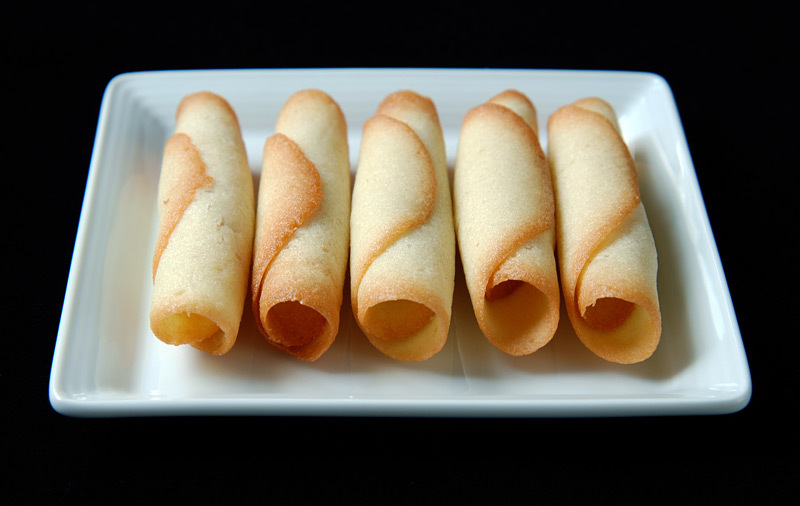 As a kid, I loved pirouette cookies by Pepperidge Farm. 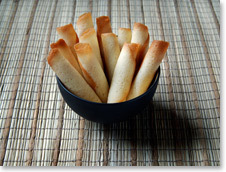 Light and delicate, the tube shape also makes them fun to eat. 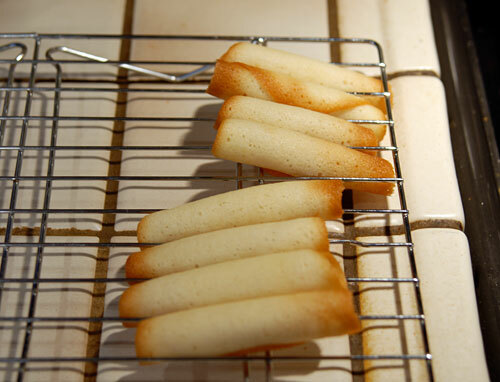 Over the holidays, a neighbor made some cat’s tongues, for which I am still awaiting the recipe, and the cookies reminded me of flattened pirouettes—shaped like a cat’s tongue, of course. Once I get the recipe from her, I will be sure to share it here. While waiting for the recipe, I got to thinking about making pirouettes, especially since they go really well with gelato (see photo from my last post about gianduja gelato). When I noticed that this recipe calls for just egg whites and the gianduja gelato needed the yolks, I knew I had to make them together. 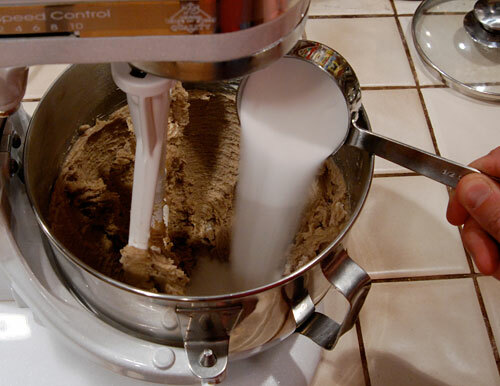 When I first made these cookies, I followed the original instructions, which said to spread the dough with a spatula. That turned out a lot easier said than done, and I just ended up with some messy blobs. I thought about ways to get the dough to spread more, and figured that since these cook so quickly already, why not just add the dough to hot cookie sheets? I placed the silpat-lined cookie sheet in the oven and let it get nice and hot. I then removed the sheets from the oven and spooned on the dough. It definitely spread better, especially around the edges, where the dough was a little runnier. Finally, I thought I would heat a little dough in the microwave for just a few seconds. 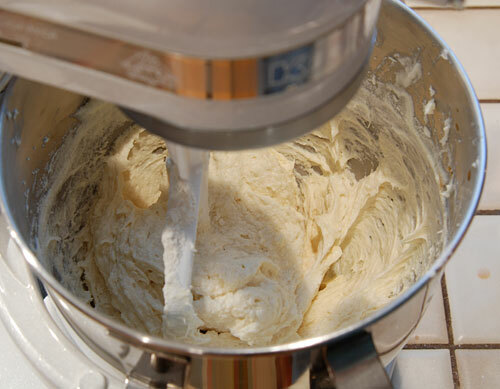 Just 8 seconds for 1/2 cup of dough resulted in a thick batter I could coax into pouring without losing any volume. Combined with the hot cookie sheets, this worked really well. After pouring 4 equal dollops on the hot cookie sheet, I tilted the sheet at all angles to help the dough spread into thinner, larger circles. 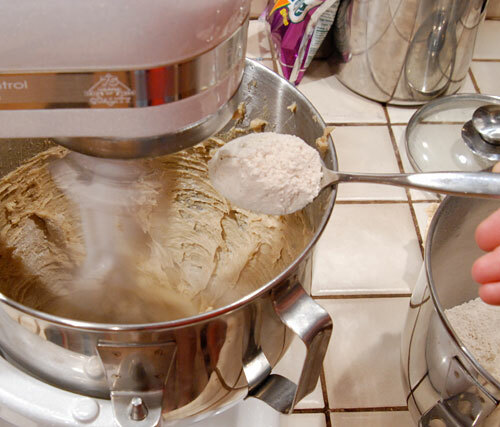 These cookies come out of the oven hot, but if you work quickly and utilize the spatula and wooden spoon handle enough, you don’t need to wear any kind of gloves while rolling the cookies. 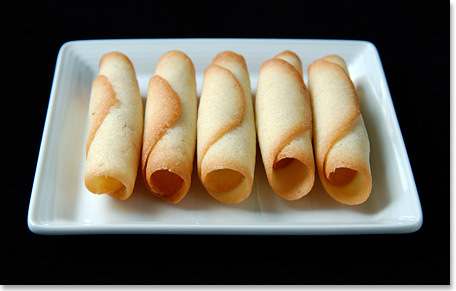 The finished cookies are very similar to Pepperidge Farm’s pirouettes, though I think these are a little more buttery. The original recipe instructions advised against browning anything but the very edges, but I found that minimal browning resulted in a cookie that wasn’t very crunchy. We liked the over-browned ones more for this reason, so definitely err on the side of too dark than too light since they are more forgiving for over-browning. I made these two weeks ago and they are still crunchy. 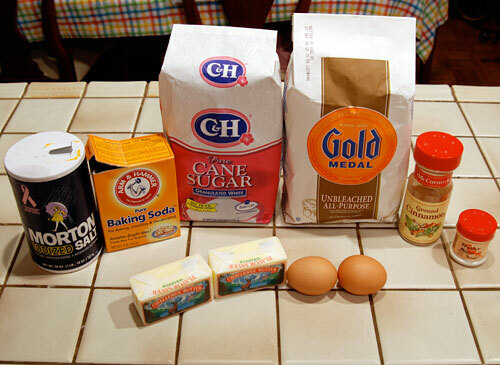 Ingredients for making Pirouette Cookies. 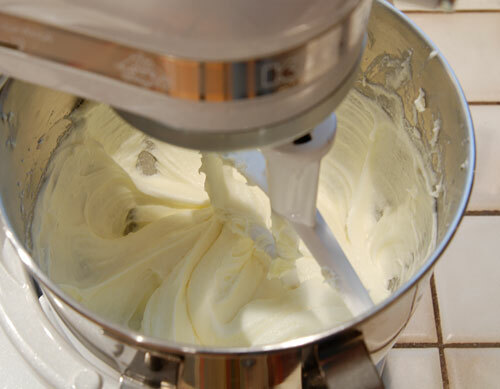 Beat 1 cup of room temperature butter, 1 cup of sugar and 4 egg whites together until fluffy. Add 1 teaspoon vanilla extract. 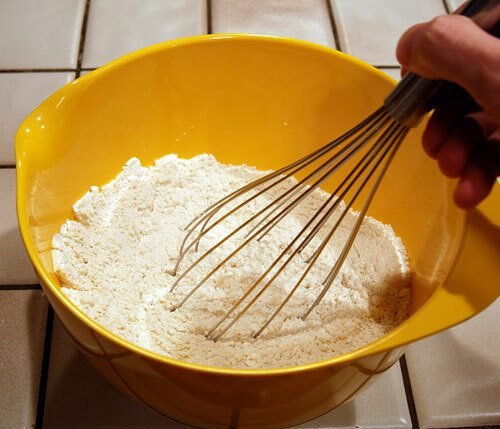 Slowly mix in 1 cup of flour until just blended. Scoop out 1/2 cup of dough and heat for 8 seconds in microwave to thin and warm. Pour a tablespoon of dough onto preheated, silpat-lined cookie sheet. 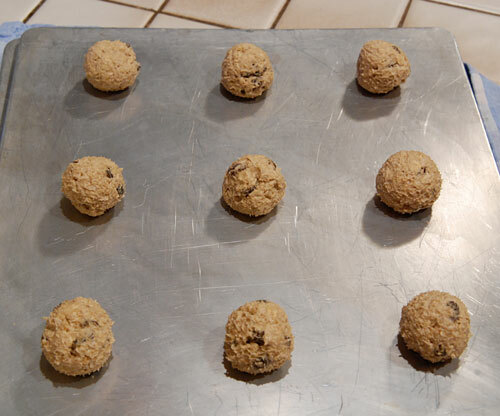 Once dough for 4 cookies is poured, tilt cookie sheet at all angles to spread dough. 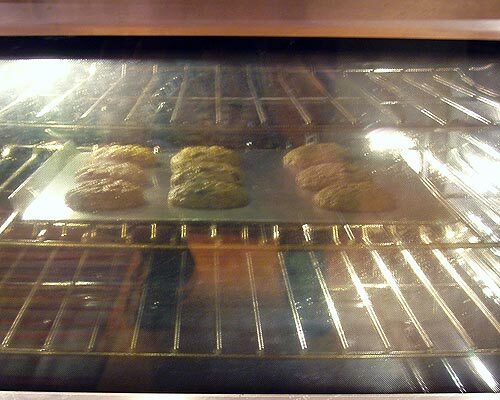 Bake for 4 – 6 minutes in 400° F oven until edges brown. 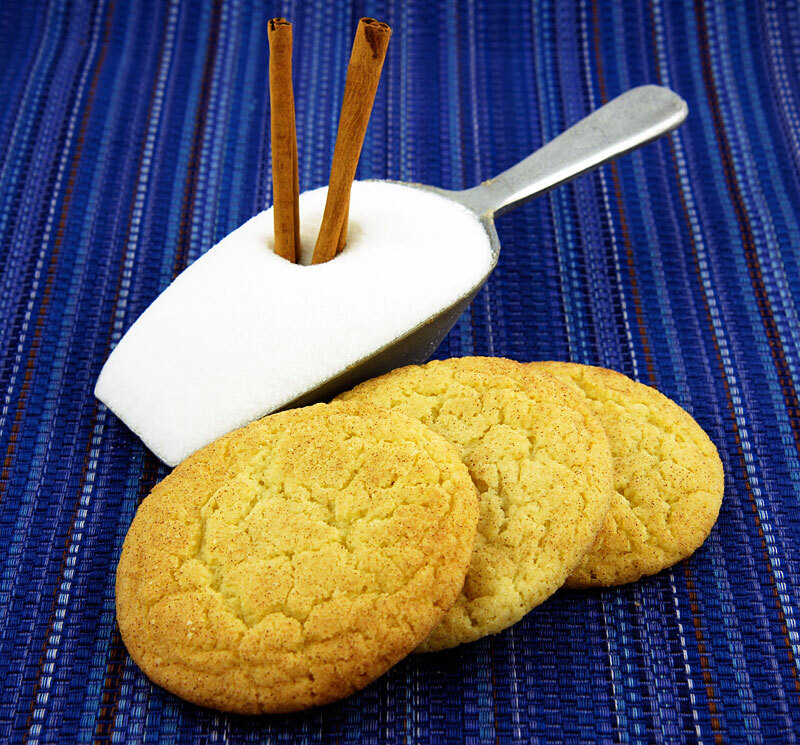 Use spatula to lift hot cookie from cookie sheet and place over handle of wooden spoon. 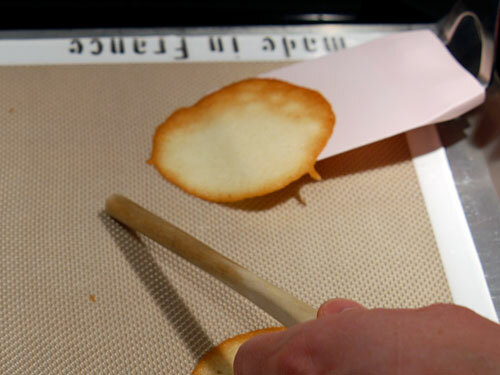 Drag one hanging edge of cookie under wooden spoon and then lower wooden spoon to begin rolling, pressing on seam when finished. 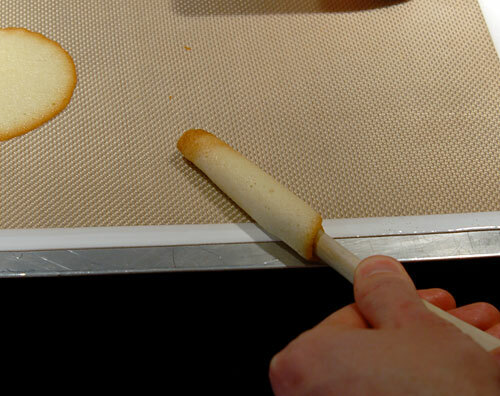 Place rolled pirouettes on lowered cooling rack to cool and help prevent unrolling. The recipe pictured above, with detailed instructions and complete photo gallery can be found on the Pirouette Cookies recipe page.